Not long after my last post this past Thursday night, we had a bad storm come thru late that night and into Friday morning. When I got home from work on Friday afternoon, I noticed the computer was off and when I went to turn it on, nothing happened. I can't get it to come on for the life of me! I'm not sure if it has something to do with the storm or not. So anyway, I am without a computer for the time being (I am using a friends computer to write this post). I am taking my computer to a friend at work tomorrow who is going to replace the power supply for me. Hopefully that is all it is and I will be back up and running in the next few days. So, I apologize for the inconvenience. Don't forget about us! Check back in a few days and we should be back to normal daily posts (hopefully!). 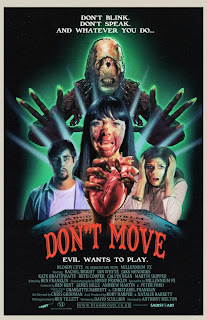 Check out the gory short film, DON'T MOVE! Check out this great short film my buddy Caleb told me about earlier this week titled DON'T MOVE. The film is about a group of friends playing with a Ouija board that unleash a demon among them. DON'T MOVE was written by David Scullion and directed by Anthony Melton. The film is very well made with some really good gore. The film is part of the U.K. series of short films called Bloody Cuts. I will have to check out some of the other films from this series, hopefully they are all this good! This looks like it will be a very intense film. THE PURGE is scheduled for theatrical release on May 31st of this year. Watch the trailer and let me know what you think! 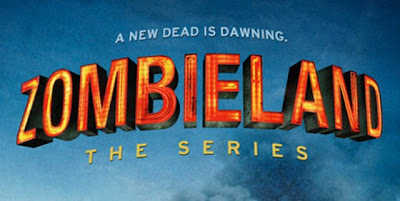 As most of you know, the sequel to ZOMBIELAND was scrapped a while back, and then amazon.com picked up the rights to make ZOMBIELAND: THE SERIES based on the film. When I heard this news, I was skeptical to say the least. In fact, I pretty much wrote it off before even watching the first episode. Well, I heard episode 1 was out, so I thought I might was well check it out...expecting to be sorely disappointed. Well, I am happy to say that I was dead wrong about this series. It was much better than I expected. I expected a toned down version of film, but instead we are given a show that lives up the movie in terms of humor and in gore! There are some great kills in this show. The cast is great, and seem to have good chemistry. I highly recommend you check this show out. I will be highly anticipating the next episode! Be on the lookout for the new Bigfoot film, STOMPING GROUND! The film is in post production now. If you want to help support the film, you can make a Paypal donation over on the film's official website. Also, for the latest news about the film, follow STOMPING GROUND on facebook and Twitter using the links below. Look for the film sometime in 2014! The wait is over! Rob Zombie's THE LORDS OF SALEM is in theaters today!!! Well, it's in some theaters at least. Apparently the film got a limited release so not everyone will be able to enjoy this film even though some of us have been waiting for this film since we reported about it way back in 2010 (see post)! Can you tell I'm a little bitter? Oh well....I have actually moved on from the anger stage and now I am at grief. I was looking so forward to this film. Ok, enough about me and my problems...what about you? 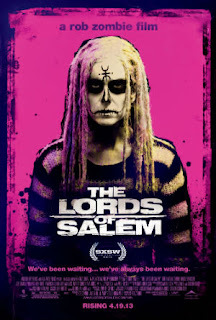 Are you seeing THE LORDS OF SALEM tonight or this weekend? Hopefully it is playing near you! If you see it, please leave a comment on here telling us all how it was. I have heard mixed reviews.....what are your thoughts on it? Help support the latest film project from the team behind A CADAVER CHRISTMAS! A while back I did a review of director Joe Zerull's holiday horror film, A CADAVER CHRISTMAS. You can see that review HERE. Well, Mr. Zerull and his Natural Wipe Films production team is back with a brand new project that he is working on. He has an indiegogo campaign set up to raise some money for the new film. There are no real details about the film yet, but if you visit the project's indiegogo page, you can view a video of director Joe Zerull discussing his new project, and get a sneak peak at some of the story boards from the new film. Zerull promises that the new film will have a much darker tone to it, comparing it to the tone of films like HENRY: PORTRAIT OF A SERIAL KILLER and MAN BITES DOG. Check out the indiegogo page and pledge some $$ to help support this film. There are only 12 days left in the campaign, so please help out if you can. There are some great perks, including chances to get your name in the credits of the film! I liked this film a lot. I have to admit it was a little confusing at times and it lives up to the term "mind-trip" that people have been using to describe this film. This film will mess with your mind on many levels. The acting in this film is amazing...not a bad performance in the entire cast. The film looks really good, and looks like it costs more to make than it probably did. There are some amazing effects in this film, including the highly touted "Meat-Monster" you have probably heard something about. One great thing about this film is it starts off with a bang and never lets up. There are no slow spots to speak of in this film. It is fun and entertaining the entire time, which is very rare in most films. This film is hard to review, as there is so much going on, so pick up a copy and check it out for yourself. I was entertained the entire running time, and I think you will be too. A series of eerie events slowly unfolds when a wine cabinet sells at an estate sale in Oregon. It is soon sold and resold on eBay’s Internet auction, and each new owner becomes desperate to get rid of the box along with the health problems, accidents, or death they claim came with it. Jason Haxton, the curator of a medical museum in a small Missouri town, learns of the mysterious cabinet and is intrigued by it as an artifact to be studied and researched. 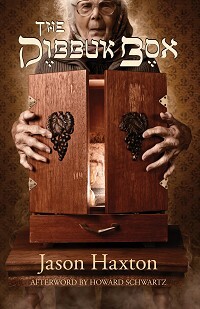 He places a bid on eBay and soon finds himself the proud owner of the dibbuk box. But as he carefully investigates and records everything he can about this unusual item said to be possessed by a Jewish spirit, Haxton discovers far more than he bargained for. In this true account, a dark story comes to light—a story that began at the time of the Holocaust and seems to have come full circle. This is one of the best books I have read based on true accounts. Haxton's writing style is very easy to read and his story telling skills really keep you involved in this book. If you don't believe in these supernatural type events, you might have a different outlook after reading this. Some of the stories told in this book are amazing and sound like something out of a movie. To think these events really happened is very remarkable. It is no wonder a movie was made about this subject. The author does an amazing job of chronicling all the steps he took in the study of this box. He includes e-mail transcripts, phone-interviews , and other personal accounts he had with a wide variety of people who were associated with the box at different points along the box's journey. The box changed hands on many accounts, and the book tells you of each account and why the owner decided to get rid of the box. It baffles me that someone would want to buy this box, even after hearing all that happened to the previous owners, but people are very curious and very skeptical that it could "happen to them", but as you will read, it happened to each and every person that owned this dreadful collector's item. I highly recommend THE DIBBUK BOX. It is a great read and a worthy collection to your personal library. Seems like all the old fairy tales are getting used as the basis for new horror films lately. Well, add the story of Paul Bunyon to that list with the new film, AXE GIANT: THE WRATH OF PAUL BUNYON! 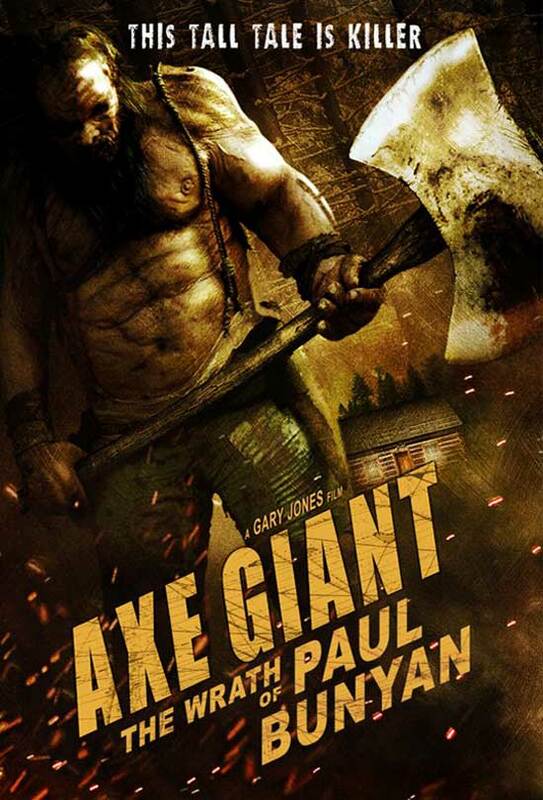 In this new film due out in June on DVD and VOD, a group of kids at a disciplinary boot-camp come face to face with the giant legend and his huge axe! 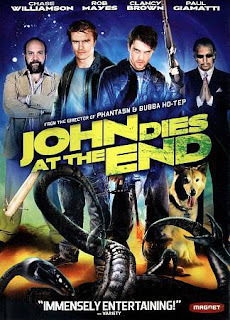 The film looks pretty cool, although pretty campy and cheesy, but what do you expect from a film like this! The bottom line is that is looks like this film will be a lot of fun! Check out the trailer and then leave a comment to let me know what you think! The 4H list of Horror Convention Tips and Tricks! I am gearing up for the upcoming Texas Frightmare Weekend in Dallas, TX (May 3-5), and I have been talking with some great folks on the TFW Facebook page, many of which are going to their first Horror Convention. I thought it would be a good idea to share some of the tips and tricks I have learned throughout the years while attending these conventions. So, here are my main tips and tricks for all you Horror Con rookies out there! Let me know if you have any specific questions, and if anyone has any other tips to add, please leave a comment below! 1. First and foremost, make sure you bring lots of money. But...spend it wisely and budget for what you want. For example, check off all the celebrities you want to meet and get autographs from. Autographs range anywhere from $20-$40 a pop at most conventions. So, average about $30 an autograph. After you have that total, then bring more for t-shirts and merchandise you might want to buy. Also, bring the cash with you at the very beginning. Most hotels will have an ATM in them, but the lines at the ATMs can be long and the ATMs can run out of money with so many people using them at one time. Also, bring smaller bills...probably nothing larger than a $20. The autograph tables appreciate if you use exact change and it keeps the lines moving quicker. A lot of the merchandise tables will take credit cards also, so you can use those when you can to save your cash for the smaller companies' tables that might not take credit cards. 2. Bring a backpack to carry all your stuff in. Even if you don't take much, you will pick up a lot of stuff from around the convention like DVDs, T-shirts, and other merchandise. You will definitely need something to carry everything in. 3. When bringing DVDs to be autographed, leave the actual DVD and the Plastic case at home. Just take the cover art paper insert since that is most likely what you will be having signed. No need for the actual plastic case to be taking up all the room in your back pack and adding extra weight to it. The best way to keep your DVD covers protected is to take a 3-ring binder filled with those clear plastic top loader sleeves/pages. Keep the DVD insert in these before and after you get them signed. But...be careful and make sure the ink is dry on your autograph before you put it back in the sleeve so you don't smear it! These pages are also the perfect size for the 8x10 photos you can purchase from the celebs. Again, just be careful when putting them in the sleeve and make sure the ink is dry as to avoid smearing. 4. Speaking of autographs, I find it is a great idea to take your own Sharpies with you. If you want the guest's autograph to be a certain color, bring that color Sharpie with you in case that certain celeb doesn't have it. Most guest will have about every color Sharpie there is, but some just bring the standard black and silver. So don't hesitate to ask if you want them to sign using a color Sharpie that you provide. 5. If you are bringing posters to be signed by any of the celebs, you will obviously want to bring them in a poster tube. I find it a good idea to label on the outside of the tube which poster it is along with the names of who you are wanting to get the signatures of for that poster. You can use the normal cardboard tubes, or if you want to store all your posters in one tube, you can get one of the larger, plastic poster tubes like these found on amazon.com. 6. I know it's too late for this year's TFW, since the hotel is sold out, but always try to get a hotel room at the hotel where the convention is being held. You might could save a few dollars by staying at a different hotel a little ways away, but believe me...you are not going to want to drive back to your hotel late at night (especially if you are doing the midnight film screening), and especially if you have had a few drinks. It is much better to just be able to hop on the elevator and head to your room. Also, after being on your feet all day, it is nice to just be able to head up to your room for a bit during the day to take a rest or a quick power nap before the evening film screenings. It's also nice to be able to take some stuff back to the room after you purchase it so you don't have to carry it around all day. 7. Bring lots of snacks. If you are staying at the hotel, you might just want to plan on breakfast and dinner at the hotel restaurant (it can be pretty pricey). Save some $$ and just eat some snack type foods for a light lunch during the day. Also, last year at TFW they had a snack bar set up downstairs with the convention that had some pretty reasonably priced food and drinks, so take advantage of that for some of your meals. 8. Make sure to bring comfy clothes, most importantly, comfy shoes. You are usually on your feet most of the time, so make sure you have shoes that will be comfortable to walk around in all day. Also, don't be afraid to dress up in a costume. It is always lots of fun to see everyone dressed up and you will usually get lots of photo requests...you will be a mini-celebrity for the weekend! Speaking of photos, obviously you do not want to forget your camera! Well...that is all I can think of right now. If any of you have any hints/tips that you have learned at conventions in the past, leave a comment and let everyone know! 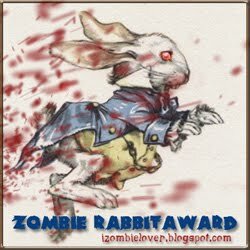 Congratulations to all of this year's Rondo Award winners!! I just want to take a minute to congratulate everyone who was nominated and especially all the winners of this year's RONDO AWARDS!! 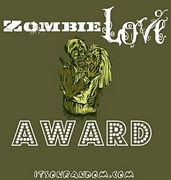 As most of you know, this was the first year that this here horror blog was nominated for a Rondo Award!! I can't begin to tell you what an honor it was to be nominated! 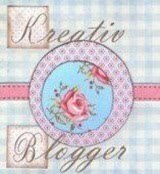 Thank you to all of you who voted for my blog! I didn't win this year, but hopefully I will be lucky enough to be nominated again next year! Tonight is the last night for voting in the 11th annual RONDO AWARDS!! This is the last night for voting in the 11th annual RONDO AWARDS!! 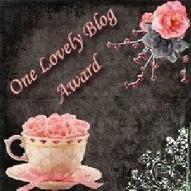 This Blog was nominated for "BEST BLOG" for the first time! I am super excited and very honored! I would appreciate your vote if you haven't voted yet. Voting is simple! Just put RONDO AWARD BALLOT in the subject line and then in the body of the message say you are voting for HAYES HUDSON'S HOUSE OF HORROR for BEST BLOG and then type your name. That is all you have to do! It wouldn't take more than a minute of your time. It would mean a lot if you would throw a vote my way if you haven't already! 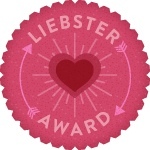 You can just vote for best blog, but if you want to vote in any or all of the other categories, visit the official ballot HERE. Voting is over at midnight tonight, so just a few more hours to go! Thanks to my buddy Caleb for telling me about this great zombie short film, CARGO. The film is only about 7 minutes long and was directed by Ben Howling & Yolanda Ramke. CARGO tells the story of a man trying to survive after a zombie outbreak while also watching out and caring for his infant daughter. This is a very well made film. Check it out and let me know what you think! Check out this cool zombie short film I ran across on YouTube. The title is DAY 31 and it was written and directed by Charlie Goldberg. This isn't your typical zombie film...these aren't the classic "raised from the dead" zombies, this film is about zombies created from a viral infection that has spread over the entire world. The film is about a man named Kyle Parker who is immune to the virus. He is searching the surroundings for food and supplies. The film end rather abruptly, with no real closure....which kinda bugged me, but mainly just kept me wanting more. I assume it was done this way to pave the way for a sequel or maybe even a feature length film. Check it out....this is a very simple film with only one main character and just some voice over dialog. Great cinematography, too! Perfect example of a great low-budget short.